Mr Z is away once again for a business trip, this time to Kuwait. This is his third business trip so far this year, and I thought I would jot down a few thoughts I have on the matter. Below, I have compiled a list of pros and cons of Mr Z going away on his business trips. 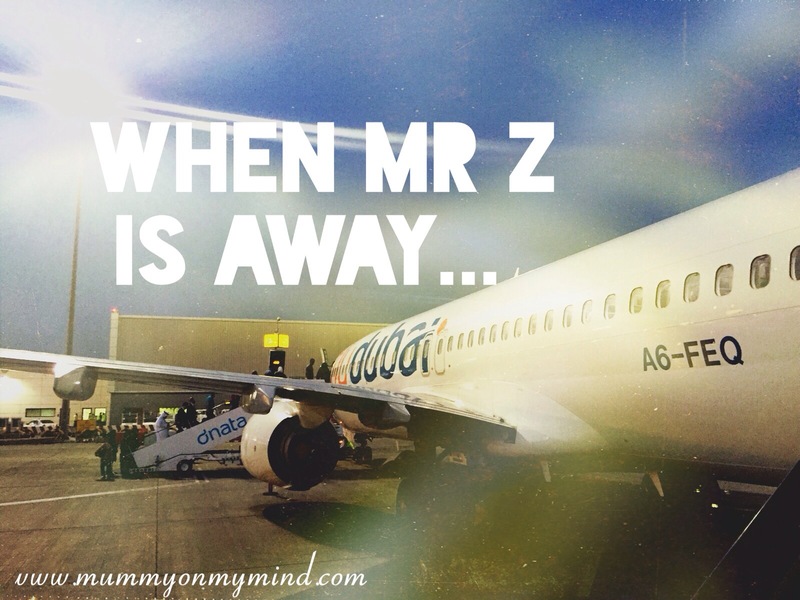 Thankfully, Mr Z’s business trips have only lasted for a short period, which can range from 3 to 7 days. This is just enough time, I feel, for us to have our own space whilst letting our hearts do the “distance make the heart grow fonder” business. Time to do other things. Once Baby Z is snug and asleep, it gives me the time to do things on my to do list such as write blog posts or blog admin. Gifts! It is absolutely mandatory that Mr Z returns from his business trip with a gift item (to make up for Con number 1). Extra mummy and Baby Z snuggles. Yay! Some “Me Time”. Stretching out in a king sized bed never felt so good! That first hug when he returns! Looking after Baby Z becomes a one man job. (Though, luckily I do have an extended family to help me out) However, daddy duties such as night time nappy changing become solely mummy’s job. Hmph. Time Differences. This horrible little thing that makes communication so difficult. Maths is not my favourite thing, so having to calculate the time each time I message or call him makes me very grumpy, especially when the time difference is greater. Hoping and Praying Baby Z doesn’t forget Daddy…I know he won’t, but the fear is always there. Having to send countless photos and videos to Daddy of Baby Z through out the day, which means my phone HAS to be with me at all times, capturing every moment. Quite a nuisance when I am trying to go about my daily business, but then I remember how much Mr Z must be missing Baby Z. Weak or no wifi wherever he is, and the anticipation of being told he has landed safely/had a good day/is completely fine. Overall, I think I quite like it when Mr Z goes on his business trips, not because I want to be rid of him, but I feel it gives us time to miss each other and appreciate the little things once we are reunited. This is of course only because his business trips are not that often, and not for too long, which is just the way I like it. Does your partner go on business trips often? Are there any pros and cons that you think I have missed out? Please feel free to share your thoughts in the comments section below! Yup And I completely agree with each and every single word you have written. When my hubby goes on trips, for me day passes by quickly ,but evening time when it’s the usual time for him to come home that’s when we all miss him,me n my 2 kids.. youngest is 15 months old,for him out of sight is out of mind but still when the door bell rings, he expects that it’s his dad ? That’s so true! Aww its funny how socially aware the little ones are, especially about things we don’t expect them to be about. Thank you for reading Parveen! ?